Featuring locking input and output hoppers and fitted with inline magnetic stripe and EMV chip encoders, the Rio Pro Secure is ideal for the desktop personalisation of pre-printed financial cards. Electronic data can be written to the card in line with the printing of customer and account details. A secure watermark can also be printed on the surface of the card featuring a specific security design or the issuing organization?s logo. 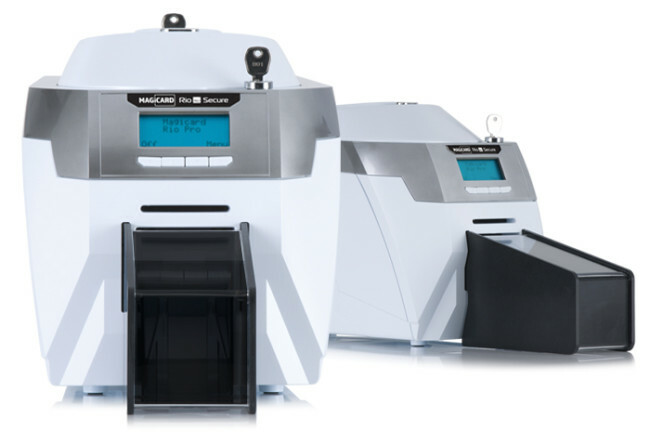 The Magicard Rio Pro Secure features an opaque, lockable input hopper to secure blank cards. A secondary lock prevents the printer from being opened by unauthorised personnel and secures the opaque output stacker hopper. A locking port designed into the base attaches the issuance station to any fixed location. Included with all Magicard printers, HoloKote® is patented technology that frosts a secure watermark onto the card?s surface during printing. The Magicard Rio Pro Secure offers the option of customising this watermark to your organisation?s unique logo or security design. The Magicard Rio Pro Secure can be equipped with a range of card encoding devices to write secure electronic data to cards at the point of issuance. Smart card encoding options include contact chip, MIFARE®, DESFire® and iClass®. Specialist high-security encoders, such as EMV accredited devices, can also be fitted for the inline personalisation of payment cards. The Rio Pro Secure can also be supplied with a magnetic stripe encoder built-in. Magicard Rio Pro Secure with UltraCoverPlus ? our promise to keep you printing. The reliability of our well-established print engine enables us to offer you a comprehensive 3 year warranty with full telephone and online support. This includes a free replacement for any printhead damaged over the lifetime of the warranty. In the unlikely event of a field failure, we will send you a replacement loan printer to you whilst we repair your existing device. *Available in the EU, North America and other selected territories. Elsewhere 1 year miminmum limited depot warranty. Card thickness 0.51mm to 1.02mm / 0.020? to 0.040? HoloKote security watermark ? custom Kit contains a CD to install the data and a Custom HoloKote card that fits into your printer.